This loveseat boasts timeless, heirloom-inspired styling that was meant to be seen, touched, and enjoyed. The attention to detail is impeccable on this piece, starting with a base of buttery-soft Argentine leather and finishing off with ornate nailheads and detail stitching. Back pillows are designed with a double pillow, bustle style for sink-in support and softness while you lounge. 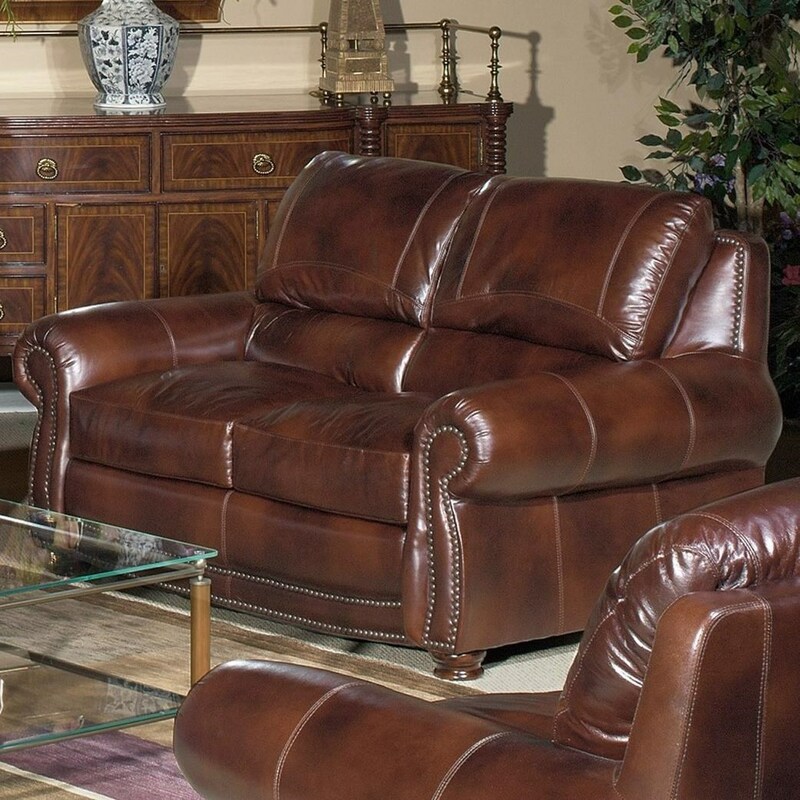 The 4650 Traditional Leather Loveseat with Nailheads by USA Premium Leather at Miskelly Furniture in the Jackson, Pearl, Madison, Ridgeland, Flowood Mississippi area. Product availability may vary. Contact us for the most current availability on this product. Fabric Content We pride ourselves on using only the best imported top grain leather, all from free-range cattle. Padding & Ergonomics Seat cushions contain muslin-wrapped spring coils for coil-on-coil comfort and longevity. Cushions are then topped with down-blend toppers for ultimate, sink-in comfort. Warranty Frames and springs are warranted under a limited lifetime warranty period. Fiber, cushions, leather, and mechanical parts are covered by a one (1) year warranty. Even though crafting furniture in the US is a much more cost-intensive and complicated process than it used to be, this manufacturer is committed to maintaining a high level of quality while supporting a community of American workers. The result is living room furniture with the durability and longevity to withstand years of wear and tear. With busy families and unpredictable kids, high quality furniture like this collection is a must. And to make sure your sofa meets your high standards for comfort, we've stuffed our cushions with resilient, muslin-wrapped spring coils and topped them with luxurious feather down. The 4650 collection is a great option if you are looking for Traditional furniture in the Jackson, Pearl, Madison, Ridgeland, Flowood Mississippi area. Browse other items in the 4650 collection from Miskelly Furniture in the Jackson, Pearl, Madison, Ridgeland, Flowood Mississippi area.